I am not certain that this event was held by the Bedford District. However, the scarcity of the patch would suggest that it was a district event, and not a council wide event, and Lake Bedford is in Bedford County, which was Bedford District. 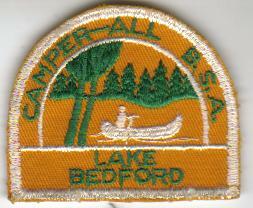 Also, this patch was obtained with other Bedford District patches from the 1950s.